So often overlooked today, what is now frequently called “snail mail” for its lack of immediacy in a world that demands timeliness, I believe that Postal mail still has its strengths. And today a simple piece of mail gave me hope. The truth is that I look forward to bringing in the mail every day, for who knows what wonderful surprises may be hiding in a pile of soon-to-be-recyclable bills and their antithesis, credit card offers. The mailman frequently drops off a stack of stress but I cherish the days when he doesn’t. Sometimes the mailman brings greeting cards meant to elicit smiles, though the ones I received recently just made me feel another year or ten older. Another year has passed me by. It wasn’t all bad, but it wasn’t all good either. Our financial tide is starting to turn, though a long road to recovery will come first. I glance at the glossy postcards for European cruises that I’ll probably never take my family on and toss them quickly toward the recycling bin. I don’t want to torture myself over what I can’t give them today, no matter how badly I wish I could. The Little Dude turned 4 years old recently. His life is just beginning. I want him to have every opportunity in the world to make his life as personally fulfilling as possible, though I know my resources will limit him to some degree. So how can I enrich their lives without being rich? Sometimes amazing experiences fall into my lap. Just as this autumn began, I received an unexpected invitation to an LA Dodgers game. What used to be a several times per year activity that I took for granted suddenly hadn’t occurred in several years. The games start at challenging times, it’s too far to easily get to, it’s expensive – those are some of the excuses I’d conjured over the last year or two for why I hadn’t gone. “Bring your family”, they said. “There’s nothing better than a father taking his son to a baseball game” they said, and my only response was “sure there is, it’s bringing two”. 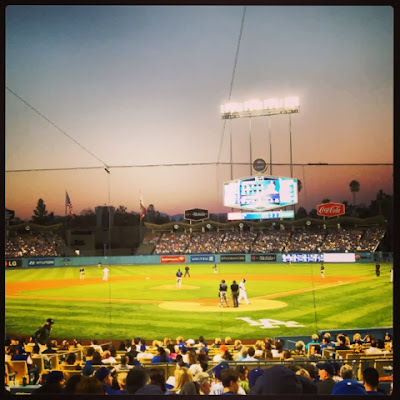 As the Los Angeles air began to turn crisp, I would take my family of 4 to our first baseball game. After navigating through torrential LA traffic and parking headaches, we made it to Chavez Ravine. Dodger Stadium, home of so many legendary moments. Kirk Gibson’s home run off Dennis Eckersley. 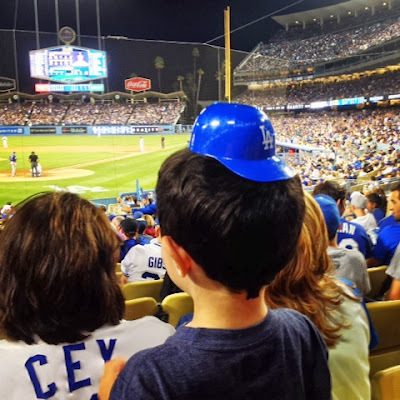 Orel Hershiser’s scoreless streak and so many more that I want to share with my sons. In due time, I told myself. Sitting close enough to hear the catcher’s mitt pop as it swallowed myriad blazing fastballs, my sons’ eyes widened at the largess of what surrounded them. 50,000-plus people wearing blue and cheering toward a common goal, another victory for the good guys. We sang while we stretched and cheered every time the ball screamed off the long pine “toothpicks”. I was enamored by watching them take in the sights and sounds of the experience. Their first Major League experience. Those moments were joy. The Little Dude wearing his Rally Cap. Though the home team lost 1-0, my family won 4-0. And not only because of the Dodgers Snuggies the team distributed to all fans in attendance. The Little Dude was hooked on America's pastime. He sang Take Me Out to the Ballgame repeatedly for weeks afterward until I introduced him to John Fogerty’s Centerfield. He asked questions about the players and the game and eagerly wanted to learn more. All in due time, I told him. With the year ending soon and rare frost in Los Angeles, I look forward to a new year filled with promise, joy and new experiences with my boys. As a frequently let-down fan of my hometown Cleveland Indians, we are often told to “wait ‘til next year”, for hope springs eternal and next year will surely be our year. Today the mailman brought a catalog. Not for clothes or plumbing supplies or stereo equipment. For experiences. And in a few months the Little Dude will get one of his own when he steps onto a baseball diamond for the first time. Wait ‘til next year? I hardly can. 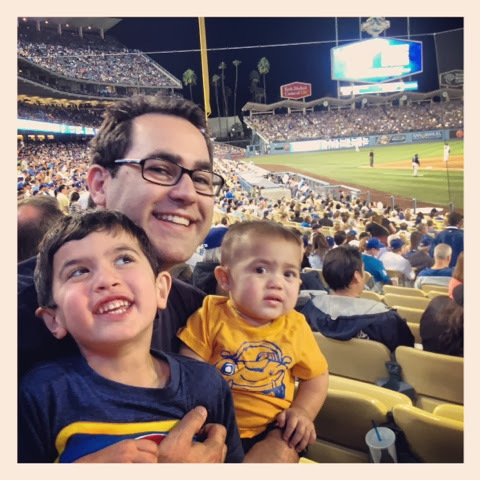 Disclaimer: The fine folks at Dove Men+Care offered me tickets to a recent LA Dodgers game as part of their "Big League Dads" campaign and it was epic. All opinions expressed in this post are solely mine, for better or worse. Love the story! We try our best to take our kids everywhere with us. I would love to take ours to a football game (tossup between Cowboys and Longhorns). I only worry about the massive amounts of people scaring them. That's a really big scene for little people. While we haven't been to a Major League game yet, I coached my son's T-Ball team this year and it was everything you could imagine it would be. It was a very cool feeling to know that I was the first one to show these kids the game that I played for so long. You're going to love it, Jay! Great story, too!